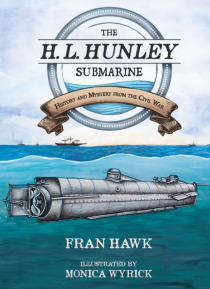 The story of the H. L. Hunley submarine is about American ingenuity and real people who were inventive, loyal, brave, resilient, persistent, and adventurous. The Hunley, built by the Confederate Army during the Civil War, was the first submarine to sink an enemy ship during wartime. After that historic feat, the Hunley disappeared. For more than a century, the fate and location of the Confederat… e submarine remained unknown. In The H. L. Hunley Submarine, Fran Hawk tells the exciting and compelling tale of how the "e;fish boat"e; was invented, how it underwent trials and tribulations in war, and how it got from the bottom of the ocean to its current resting place in the Warren Lasch Conservation Center in North Charleston, South Carolina. Who invented the H. L. Hunley? How did it operate without an engine? How and why did it sink? What did researchers find when they investigated the submarine? Archaeologists and conservationists from all over the world have studied the historic vessel in search of answers. Which mysteries have they solved, and which mysteries remain for future generations to answer?